Part fugitive, part hero, fifteen-year-old Nya is barely staying ahead of the Duke of Baseer's trackers. Wanted for a crime she didn't mean to commit, she risks capture to protect every Taker she can find, determined to prevent the Duke from using them in his fiendish experiments. But resolve isn't enough to protect any of them, and Nya soon realizes that the only way to keep them all out of the Duke's clutches is to flee Geveg. Unfortunately, the Duke's best tracker has other ideas. Nya finds herself trapped in the last place she ever wanted to be, forced to trust the last people she ever thought she could. More is at stake than just the people of Geveg, and the closer she gets to uncovering the Duke's plan, the more she discovers how critical she is to his victory. To save Geveg, she just might have to save Baseer--if she doesn't destroy it first. Since this is the second book in Janice Hardy's Healing Wars trilogy, my review is going to be a bit vague and brief, because if you haven't read book one, THE SHIFTER, well, I don't know what you're waiting for but regardless, I don't want to spoil you on that book if I can help it! I adored THE SHIFTER, so I was really excited to get the ARC of BLUE FIRE. So excited that after we picked it up at the post office, I gave my fiancé the evil eye when he put it in the backseat of the car and then explained how excited I was to have it, in great depth, the whole way home. And it didn't disappoint. One of the best things about THE SHIFTER was the world building, and it was just as good in BLUE FIRE. It isn't easy to build an entire world from the ground up, incorporate a bit of magic, and make it totally believable. But this world feels not only believable, but real. The characters and their relationships continued to be wonderful in this second book. I love how Nya manages to be a fiery little thing while also maintaining some really good relationships. She knows that she can't always do everything alone, and isn't too proud to enlist others in helping her, but she's also scrappy and never gives up. This book sees Nya having to make a lot of really difficult choices, especially with her world starting to get messy with war-like stuff (the trilogy is called the Healing WARS, after all...) and it's all handled so well. Vivid enough that you're getting the horrors of what it's like to be Nya in a bad situation right now, but subtle enough so as not to give a MG aged reader nightmares. 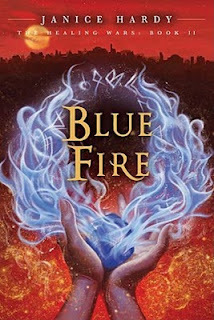 BLUE FIRE is a really strong follow-up to THE SHIFTER, and even if you aren't an avid fantasy reader, this trilogy is worth reading. If you'd like to win a (signed!) ARC of BLUE FIRE, all you have to do is comment on this post. I'll give you +1 entry for tweeting about the contest, and +1 for blogging about it or linking it on your blog, if you link to your tweet and/or blog entry in the comments as well. Giveaway will close at midnight (eastern time) on Sunday, September 26th and I'll announce a winner the next morning. US/Canadian residents only for this one (sorry). Visit author Holly Schindler's guest post for another opportunity to win a book. She's giving away a signed copy of her starred-novel, A BLUE SO DARK. This series does sound amazing! I'm totally interested in winning a copy of this! Thanks for the chance. Shifter's on my TBR. I have to check out the series. I love Janice's blog. It's a wealth of writerly advice. i'm definitely in. thanks for the contest! THis looks so cool! I am SO interested! I would love to win this ARC. The series sounds great! I read and loved The Shifter (even wrote a reivew about it), so I'm totally down with the new book in the series! Yay! Thanks for the great review, guys! I'm so glad you liked it. My daughter has been begging for this sequel. She just doesn't understand that it isn't out yet. I'd love to be entered to win this book. Sounds really good. This series sounds awesome! Definitely on the TBR pile now. Thanks for the chance to win! Thanks for hosting - I would love to win! Please enter me! I totally follow the author's agents blog and had heard about the first book through her blog. I read the excerpt the agent had posted and so wanted to read Shifter. Thank you for reminding me about it, as I just went and bought it in digital format!!! I would positively love to win an ARC of the second book. http://iamareadernotawriter.blogspot.com/search/label/Got%20Great%20Giveaways I added you to my got great giveaways post which will post at midnight tonight. I'm still trying to get my hands on a copy of the first book and the sequel is all ready to be won? Gah! Shifter was one of the best fantasy books I've read. Period. Can't wait to read Blue Fire. This sounds really good. Count me in the giveaway. I'd love to win! I'm adding these to my shopping list! I would like win this book. I'm halfway through The Shifter and I agree--great world building! I would so love to win. I loved Shifter and follow Janice's blog. It always has great advice on the craft of writing. thank you so much for the contest! i'd love to win this! Oh, I have the Shifter, would love to win this one!